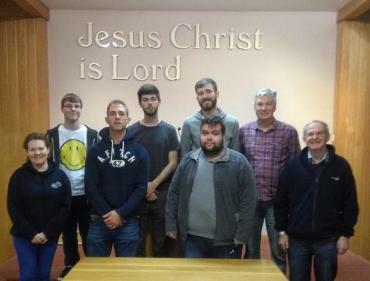 The College’s evangelism week ran in conjunction with Newcastle Baptist Church’s mission week. The mission week was carried out in an events-based format from Monday through to Friday. Each night had a different flavour to it and ranged from a ladies’ table quiz on Monday to a nostalgic evening on Friday. Our week began on Sunday, when the team had the opportunity to take part in Newcastle’s morning and evening services. After the Sunday evening service, the entire team went to the local YMCA, where the church runs a weekly drop-in session. David Cassells had the opportunity to share his journey of faith, which clearly struck a code with many of the young people. As the week progressed, outside of the mission events, the team also took part in a series of evangelistic opportunities in different environments. These included the church’s weekly football outreach in Castlewellan, assembly in local Primary Schools, Down High SU, sharing at various care and respite homes, parent and toddlers and pastoral visitation. We were also able to serve Newcastle Baptist in a range of practical ways, such as cleaning and setting up halls to help the week run smoothly. One massive highlight was Thursday afternoon, when first year pupils from Shimna College arrived at the church building to learn more about the Church. This was a fantastic opportunity - the gospel was clearly explained and the Q&A at the end included some in-depth questions. On reflection, the whole week was a great success - the team was able to work in unity and partnership with the Church. Many contacts were made and strengthened with people inside, and especially outside of the Church, as a direct result of this week.